After freeing the Trickster and attending the meeting at the Justice League Watchtower, the Rogues return to Central and Keystone City, only to see that both have been destroyed by Gorilla Grodd, who has proceeded to take control of Central City as its king and renames it Gorilla City. Captain Cold asks Mirror Master to help him get to the hospital where his sister Golden Glider is being held, in order to check on her. While there, the Crime Syndicate send Secret Society members to finish Grodd’s work and destroy the hospital. The Rogues are able to hold them off, only to be interrupted by Deathstorm and Power Ring, who were sent by Ultraman to deal with the Rogues for resisting the Crime Syndicate’s offer to join them. 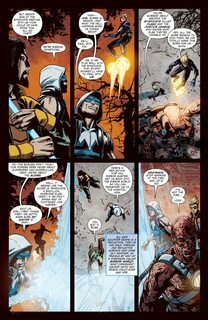 After battling Deathstorm and Power Ring, Captain Cold is separated from the other Rogues. The Rogues, now lead by Mirror Master, land in Metropolis and are confronted by Archer. Trickster is able to quickly stop him, as Parasite arrives, because the Crime Syndicate has put a bounty on the Rogues’ head. Unable to stop him, Mirror Master brings the Rogues into the mirror world to escape only to end up being caught by Poison Ivy in her district in Gotham City. Poison Ivy poisons Trickster to force Weather Wizard to move the eclipse to let her plants get sunlight. Weather Wizard says he can not, but Mirror Master says he can help if he can rebuild his mirror gun. After getting the parts and entering the mirror world, Mirror Master is able to get sunlight back to Poison Ivy’s plants. However, the vine holding him begins to break, forcing Trickster to go in after him, stopping the sunlight from coming through. The sunlight draws Man-Bats to the Rogues’ location, taking Weather Wizard, and forcing the others into Mr. Freeze and Clayface’s territory. Mr. 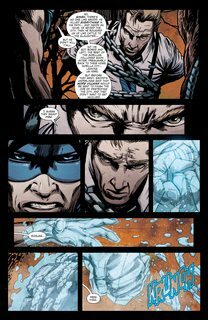 Freeze tells Mirror Master he is not interested in capitalizing on the bounty on their head, only to use Weather Wizard to create optimal conditions for him to freeze Gotham. As the Rogues are fighting the two, Black Mask arrives to capture the Rogues to receive the bounty. To escape, Triskster arrives with an Arkham van, having been separated from the others. Still being chased, Heat Wave sacrifices himself to allow the other Rogues to escape. However, they are stopped by the Royal Flush Gang. As the Gang transports the Rogues, Weather Wizard is able to free them, only for Mirror Master to blame him for killing Golden Glider. 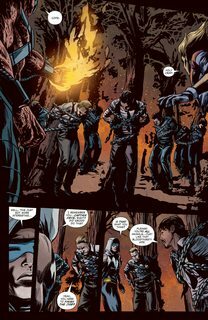 Choosing to leave, Mirror Master and Trickster go to the Royal Flush Gang’s hideout alone to surrender. However, they use Mirror Master’s constructs to distract them, while Trickster is able to rescue Golden Glider and bring her to the safety of the Pied Piper. Heading back to help Mirror Master, Trickster is greeted by Johnny Quick and Atomica. The duo nearly defeat Mirror Master and Trickster before Weather Wizard returns. The Royal Flush Gang are able to shoot Weather Wizard, as Grid teleports away Johnny Quick and Atomica, and sends Secret Society members and Grodd in their place. Pied Piper leaves protecting Golden Glider to join the Rogues in the fight against Grodd and the Society members. Seemingly defeated, the Rogues are joined by Golden Glider, who has woken up, due to the Pied Piper’s music. Together, they are able to trap Grodd and the Society members in the mirror world, allowing Central City to begin the rebuilding process.